United Way 211 is a system of help via telephone - a single integrated source for information about community services, crisis intervention and referrals to health and human services. It is accessed toll-free from anywhere in Connecticut by simply dialing 2-1-1 and operates 24 hours a day, 365 days a year. Multilingual call specialists and TDD access is available. Last year, 2-1-1 helped 23,351 callers from New London County with free information and referral. Connecticut residents dial 2-1-1 for many different types of help. Professional call specialists help callers with such complex issues as substance abuse, gambling, domestic violence programs, suicide prevention, financial problems, and much more. Other callers may simply be looking for volunteer opportunities. By dialing 2-1-1, a caller is connected with an information specialist who helps the caller assess their situation and finds the closest community services that can assist them. It’s important for people to remember that 911 remains the number to call for police, fire or EMS emergency response and 411 remains the number to call for telephone directory information. United Way 211 has developed the state’s most comprehensive database of human service resources. It is continuously updated, providing the foundation for mailing list, a statewide directory available on CD Rom, and a searchable database on http://www.211ct.org/. The collection of data on demographics and caller problems provide another valuable resource by presenting an overview of the challenges faced by Connecticut residents. This data is used for many types of human-needs assessments in the state. Customized arrangements enable many non-profit agencies to provide after-hours coverage for their clients. 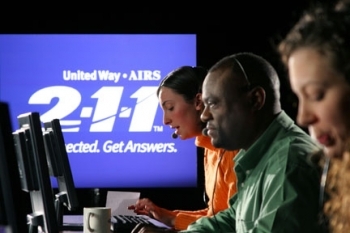 United Way 2-1-1 call specialists screen calls and access agency staff when crisis intervention is necessary. A mother seeks counseling for her son who is not going to school regularly. A caller is depressed, considering suicide and desperately needs help. In the middle of winter, a man is dislocated from his job and needs oil assistance to heat his home and keep his family warm. An elderly woman just lost her husband of 50 years to cancer and wants to find a support group. The caller needs information about eligibility for SNAP. A guidance counselor is searching for a parenting education course for a teen father. A recent widower is looking for a social group to join. A caller with gambling problems seeks services for help. A traveler wants to know how to get a passport. A teenager has problems at home, a father who drinks, and needs someone to talk to. A nearly life-long smoker wants to find a local smoking cessation program. An older man caring for his wife with advancing Alzheimer’s is now exhausted and needs assistance and respite. A recently divorced person keeps missing work to take care of the children and needs an open slot for affordable child care. 211 is a public/private partnership between the State of Connecticut and Connecticut United Ways. 211 is accredited by the Alliance of Information and Referral Services (AIRS) and by the American Association of Suicidology (AAS).